That’s right: X-Net! If it sounds futuristic and vaguely badass, it’s because it is! The vigilant observer might spot me astride this sweet piece of one-speed fury on the streets of Shanghai. I may be utilizing its convenient front basket, or ringing the bike bell to warn the unwary pedestrians in my path. I won’t be taking too many sharp turns, though, because that would involve smacking my knee with the handle bars, but that’s neither here nor there. The bike is big enough for me to ride. P.S. 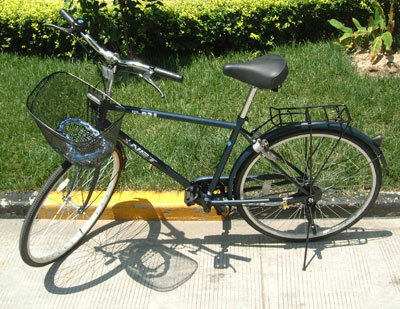 Dear bike thieves in China: Don’t steal this bike, regardless of how awesome I just said it is! I find that my feeling of one-ness with the city is at its max point when I take bus 136 home after work, or do the People’s Square Metro interchange at rush hour. A sardine is a sardine is a sardine. Embrace public transportation, John! Getting a monthly bus pass for my favorite bus line made me feel less foreign. Hey John, cool post! At Heidi’s collegue’s house party the other Friday night in Berkely, we were sippin’ on Corona’s and Tsing Tao’s, the others were fillin’ their cups with a batch of Sangria. The party was celebrating the go away of Heidi’s colleague to LA film school. He had made a couple films, one a documentary of his return to Vietnam. And just like you said, he felt anonymous and part of the fast-moving foreign world around him when he got on his motorbike scooter. The exhiliration and pseudo anonyminity (sp) was fully covered in his documentary. It’s true, when in Rome do as the Romans. Is that how it goes? Anyways, it works! By the way, do you have to approve your comments now? I noticed there is a considerable lag between post and publish. Some comments must be approved. The way it’s supposed to work is your comment needs to be approved the first time you leave one, and then later it gets automatically approved. I’m not sure why yours require approval so often. Hmm, the bubble of foreignness (like the cone of silence? ), interesting concept. I second Micah’s sardine remedy. Especially on a two or three hour bus ride, when the person beside you has nodded off to sleep and has their head resting on your shoulder, and your knees are next to your ears because your feet are resting on top of a huge bag of farm produce. I moved from the USA to Hsinchu Taiwan. My bike certainly makes me at one point one with the locals and yet also a target as they are on scooters. But I hold my line in traffic and now all seems quite a normal way to commute. It also is great to ride in Taipei get off and watch visitors stare. The one time I rode a bike here I felt like I got more stares and more shouts of “laowai!” than usual…that could’ve been because of my cowboy hat, though. I often find myself forgetting that I’m foreign (or maybe I just forget that I’m in a foreign country). I’m just walking around, going about my business, when someone either looks at me funny or points at me. It usually takes a second of wondering what’s so interesting — sometimes even turning around to see if there’s something behind me — before I remember that I’m different. And I am different — whether I’m on the subway, the bus, a bike, or the sidewalk, I’ll never be Chinese. I don’t see any reason to pretend otherwise. So by enjoying riding my bike I’m pretending to be something I’m not? That strikes me as kinda ridiculous. I went to the new Walmart (first one in Shanghai!) this evening to check things out, by taking the subway under the river to Lujiazui and then switching to a packed bus 975 (or so) for the ride down to Longyang Rd. At my stop, I felt like I was going through the birthing process a second time, as I had the whole bus yelling at the driver with me to open the back doors, and then was literally priying myself through mounds of flesh to POP out of the back door, almost taking three or four people with me. I was the only person to get off. I love riding my bike around Qingdao. Down the stairs, up the stairs, over the cliffs on the back wheel, on the front wheel down the beach front. I figure the natives will stare at me regardless, so I might as well at least give them a show. Specialized M5. Not as cool as teh Xnet, but I live in hope. o man I love to ride my bike in China, I call it “riding the gauntlet” because every now and then you just have to take a deep breath and go for it, hoping that giant bus spouting diesel fumes into your face is going to stop in time, while the motorcycle taxis next to you are cranking out the hits from euro dance party 1997. What, no moped? Mopeds are much better than bikes. They’re faster, and you don’t arrive at your destination soaked in sweat. Everyone is falling over each other to see who can be the most “local”…well, fah, I know plenty of foreigners with bikes, but I’m the only one I know with an electric bicycle. Pray it doesn’t decide to fall apart when you’re on it. Mine did. I hurt.